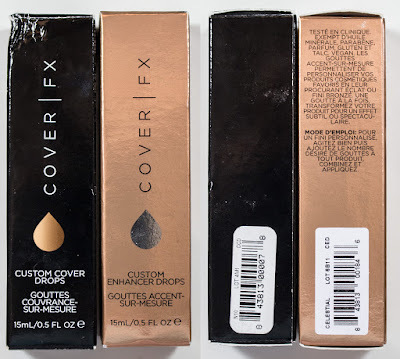 The COVER FX Custom Cover Drops retail for $44US and $56CAN for 0.5 fl oz of product. 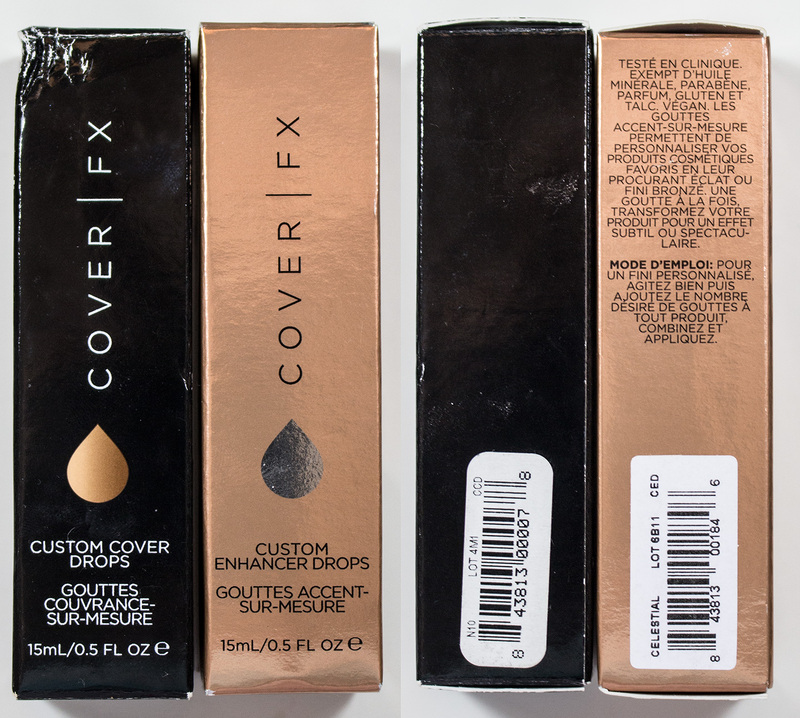 The COVER FX Custom Enhancer Drops retail for $42US and $52CAN for 0.5 fl oz of product. 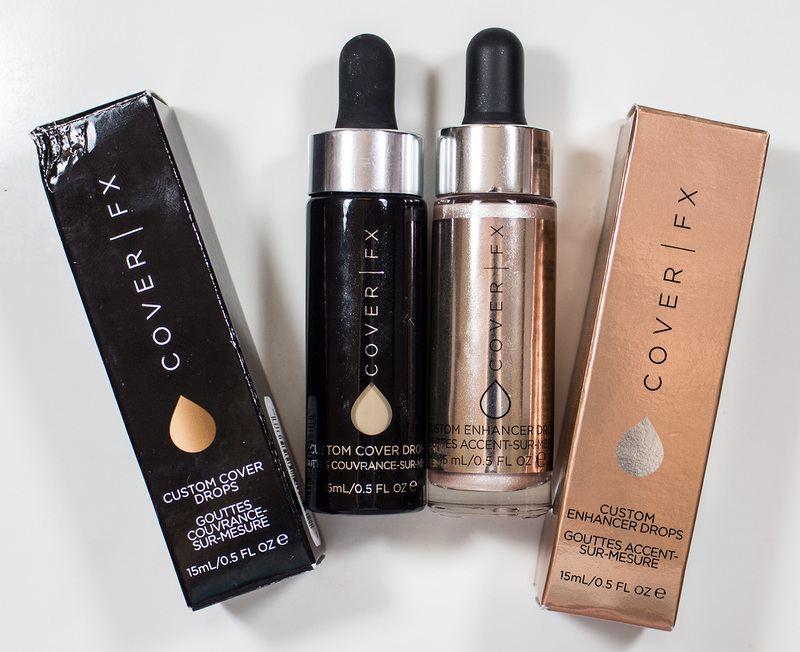 COVER FX Custom Cover Drops in N10 & Custom Enhancer Drops in Celestial boxes. COVER FX Custom Cover Drops in N10 & Custom Enhancer Drops in Celestial front of bottles. This formula is a sheer to full coverage foundation with a more liquid texture compared to most silicone base foundation. 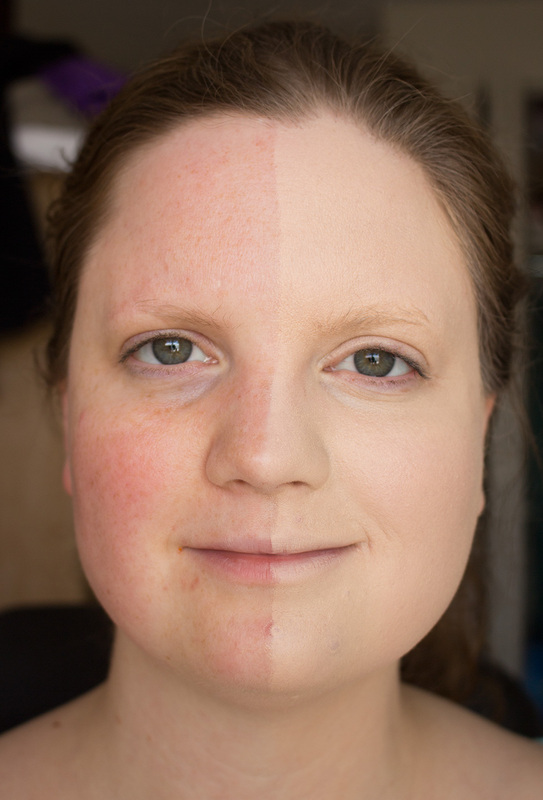 I found it easy to sheer out on the skin of build up in layers to wear as a full coverage foundation. Because of its liquid consistency made it a great product to mix with other foundations or make a costume tinted moisturiser. In my case I mixed it with Make Up For Ever Step 1 Skin Equalier Redness Correcting Primer to cool the N10 shade down and make it more olive toned foundation when using it as a foundation. 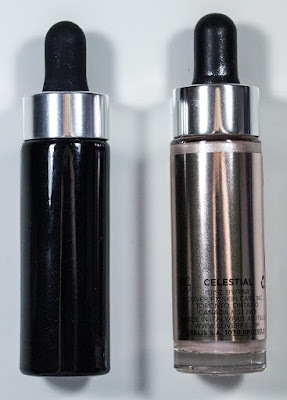 My review on the Custom Enhancer Drops in Celestial you can find here as the full size I purchased has the same properties as the sample I got from Sephora. N10 is a pale slightly warm skin tone that is more peach than neutral in colour. 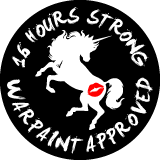 Wear: I got 14+ hours wear before I noticed fading without a primer or powder before I notice the product breaking down. 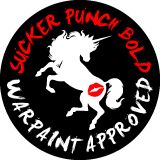 With a primer and powder it does last longer! 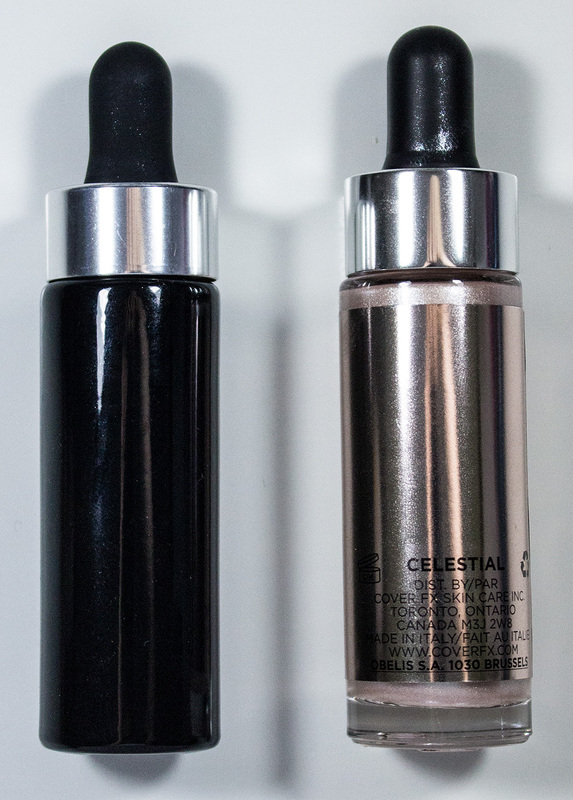 COVER FX Custom Cover Drops in N10 & Custom Enhancer Drops in Celestial bottleneck size. 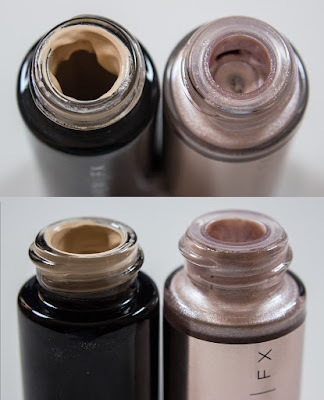 COVER FX Custom Cover Drops in N10 & Custom Enhancer Drops in Celestial bottleneck rim. The COVER FX Custom Cover Drops & Enhancer Drops comes in a glass jar with a dropper lid. But I have a beef with this packaging the Custom Cover Drops bottle would leak not matter how tightly I cranked it on. The seal wasn't complete sealed which allowed Ethyl Trisiloxane to evaporate while the bottle was closed. 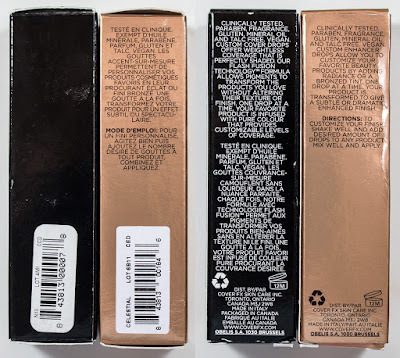 I bought this foundation last year when it came out and in 6+ months almost half the product volume has disappeared. The Custom Enhancer Drops on the other has had many revisions to both the bottle and lid. The bottleneck is wider with a sharper edge to it compared to the thinner and rounded edge of the original Custom Cover Drops. The top baffle/diaphragm seems to create a strong seal that you can feel the pop as you open the lid after you crank it down,but the original Custom Cover Drops packaging you do not get the same feedback in pressure. COVER FX Custom Cover Drops in N10 & Custom Enhancer Drops in Celestial. There was not leaking either as you can see up top (right) you can still see the black diaphragm showing though and you can the "cut line" of the edge of the glass neck after shaking upside down. I did the same thing with the original Custom Cover Drops packaging, but I first cleaned the lid out of any product and then shaken it upside down again. The product not only filled the cap but also spread into the screw tracks in the lid slightly. 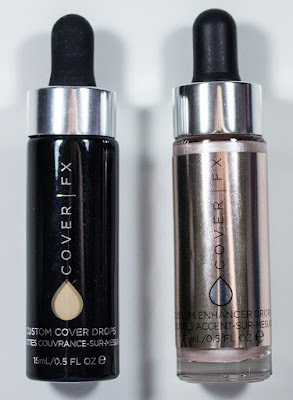 COVER FX Custom Cover Drops in N10 & Custom Enhancer Drops in Celestial lid size. 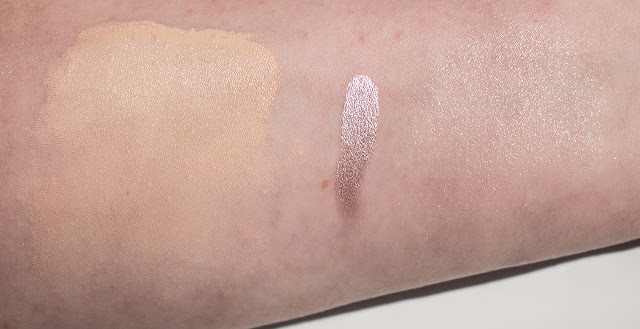 ylight swatch: COVER FX Custom Cover Drops in N10 (heavy at top and sheered out towards the bottom) & Custom Enhancer Drops in Celestial (heavy and buffed out). Flash swatch: COVER FX Custom Cover Drops in N10 (heavy at top and sheered out towards the bottom) & Custom Enhancer Drops in Celestial (heavy and buffed out). COVER FX Custom Cover Drops in N10 on the left side of my face. This cover EVERYTHING if you use it as a foundation. You can see that it caught on my pour dry cystic acne on my chin and some of that painfully red/purple tone is peeking through. But for the most part, I'm a blank slate with this one and it's not too thick either when you go full one. There was so very subtle redness peeking through on my check area but it's not very noticeable at first. 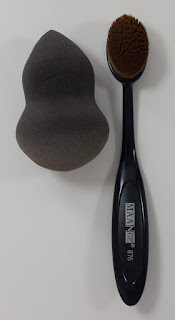 The tools I used was my toothbrush style face brush which leaves minute strokes in the foundation but the blending sponge used wet took care of them. 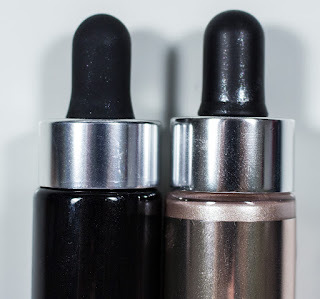 I do like this product range so long as they make sure that the lid seals shut now I have to problem recommending these custom drops to anyone as they have the widest range of shades for all skintones.